The planning authority says the proposed multistorey would be “unacceptably dominant in the city”. 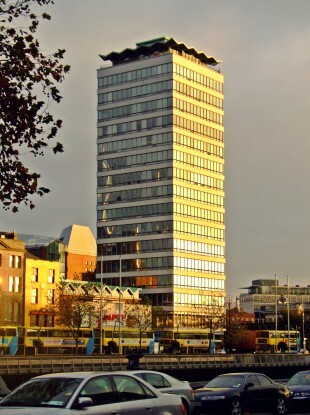 SIPTU had wanted to replace the current Liberty Hall with a 23-storey tower. AN BORD PLEANALA has refused a planning application from SIPTU to redevelop the landmark Liberty Hall building in central Dublin. The authority this morning said its board had unanimously decided to refuse permission for the redevelopment, saying the proposed new 23-storey building would be “unacceptably dominant in the city”. The authority said the proposed new tower would be “visually intrusive in the streetscape and riverscape, and would seriously injure the visual amenities of the city and its skyline”. It further added that the development could “seriously detract from the setting and character of the Custom House, would intrude on the O’Connell Street and Grafton Street Architectural Conservation Areas”. Dublin City Council had granted permission for the 100m-tall development in February, though it had included 19 conditions including a realignment of some of the upper levels of the building. Irish Life Assurance plc, the life assurance arm of the State-owned Irish Life – and others had then appealed the decision to An Bord Pleanála. The proposed new tower – which was to include a public observation deck and a four-storey heritage centre – would have replaced the existing 17-floor tower and the adjoining two-storey building, which currently stands 60 metres above the ground and was finished in 1965. An Bord Pleanála said the site was of “national historic and social significance” given its location close to Custom House, which is considered to be “of primary importance in the state”. It said policies laid out in the Dublin City Development Plan 2011-2017 meant the authority had an policy “to protect and enhance the skyline of the inner city”. Email “An Bord Pleanála refuses permission for new 23-storey Liberty Hall”. Feedback on “An Bord Pleanála refuses permission for new 23-storey Liberty Hall”.